RC Central Wyatt Jungclaus captures the 170 pound title. RAPID CITY, S.D. 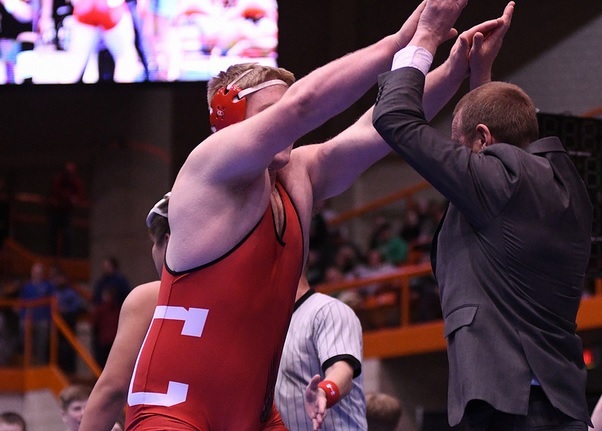 - Rapid City Stevens crowned two champions and won the team title over Pierre as the State A Wrestling Tournament wrapped up Saturday night in Rapid City. Stevens finished with 162.5 points, ahead of Pierre with 133.5. Rapid City Central was third with 132. For the Raiders, Landen Fischer won the 113 pound title with a 5-2 decision over Cael Larson of Rapid City Central. Cooper Voorhees won the 152 pound title with a win over Nolan Johnson of Madison. Other area wrestlers winning titles were Wyatt Jungclaus, who capped of a stellar season for the Cobblers with a 5-4 decision over Ryan Meyer of Harrisburg at 170. Max Sailor of Spearfish brought home first place in the 132 pound bracket with a win over Logan Serck of Beresford/Alcester-Hudson. For the Scoopers, they finished 13th in team standings. Top finishing Scoopers were Kaden Olson in third place at 106 and Jacob Wood in third at 120. Olson beat Jack Schoenhard of Stevens in a 6-0 decision and Wood won a 6-1 decision over Logan Fischer of Stevens. Other area third place winners included Declan Malone of Stevens at 132, Kadyn Kraye of Centrla at 138, Colton Jackson of Douglas/RC Christian at 152 and Nolan Smith of Central at 220. Lynn's Dakotamart, Mountain Pines Outdoor Wood Furnaces, Arby's of Sturgis, Scott Peterson Motors, Kwik Mart and Sturgis Subs, Northern Hills Eye Care, Richter Tire and Exhaust, Casteel Auction and Real Estate, CBH Coop, Jake's Collision Repair, Brian Orlieb/Farm Bureau Insurance, Sturgis Chiropractic, Jacob's Auto Repair, Tom's T's, Northern Hills Federal Credit Union, Eddie Heisinger/American Family Insurance, Just for Looks Boutique and Loftus Dental in Sturgis.